Human embryonic stem (ES) and induced pluripotent stem (iPS) cells can be maintained and expanded indefinitely in an undifferentiated state in specific conditions. For example, human ES and iPS cells can be maintained in the defined, feeder-free media mTeSR™1 or TeSR™2, on coated surfaces such as Corning® Matrigel® . In order to propagate the cells successfully, cultures must be serially passaged when colonies become large and near-confluent by dissociation into small cell aggregates and seeding onto new dishes. Historically, methods included mechanical dissection of undifferentiated colonies under the microscope, which is very precise but labor intensive. The most common method for generating cell aggregates today is by partial enzymatic dissociation of the adherent colonies, typically using enzymes such as collagenase (Catalog #07909) or dispase (Catalog #07923), followed by removing the dissociated colony pieces from the dish as free-floating cellular aggregates. These enzymes are effective, but must be inactivated or diluted out prior to replating the cell aggregates to prevent reduced attachment and poor survival. The following protocol is a new, enzyme-free alternative for passaging human ES or iPS cells that are grown in mTeSR™1 or TeSR™2 on Corning® Matrigel® , using STEMCELL Technologies’ Gentle Cell Dissociation Reagent (Catalog #07174). This product is an enzyme-free, chemically defined, and animal component-free reagent that is gentle on cells, allowing great expansion of human ES and iPS cell cultures. The procedure described below uses mTeSR™1 medium; TeSR™2 can be substituted without further changes. Volumes are listed for 6-well plates; if using alternate sizes of cultureware, adjust volumes according to surface area. At least 1 hour before passaging, coat new passaging dishes with Corning® Matrigel®. Aliquot approximately 2 mL of mTeSR™1 medium per well to be passaged plus 2 mL per new well to be set up, and warm to room temperature (15 - 25°C). Aliquot 1 mL of Gentle Cell Dissociation Reagent per well to be passaged. Use a microscope to visually identify regions of differentiation. Mark these using a felt tip or lens marker on the bottom of the plate. Sterilely remove regions of differentiation by scraping marked areas of the plate with a pipette tip or aspirator. Note: This selection should not exceed 20% of the well if the culture is of high quality. Remove medium from the well and discard. Add 1 mL/well of Gentle Cell Dissociation Reagent. Incubate at room temperature (15 - 25°C) for 6 - 8 minutes. Remove and discard the Gentle Cell Dissociation Reagent. Add 1 mL/well of mTeSR™1 medium. Gently detach colonies by scraping with a glass pipette or a cell scraper. Note: Take care to minimize the breakup of colonies. Optional: Rinse the well with an additional 1 mL of mTeSR™1 to collect remaining cell aggregates. Note: Centrifugation of aggregates is not required. Carefully pipette the cell aggregate mixture up and down 2 - 3 times with a 2 mL serological pipette to break up the aggregates. A uniform suspension of aggregates approximately 100 μm in size is optimal; do not create a single cell suspension. Plate the cell aggregate mixture onto a fresh matrix-coated dish prepared in step 1. Add mTeSR™ as required to bring the volume up to a total of 2 mL per well. If the colonies are at an optimal density, the cultures can be split every 5 - 7 days using 1:10 to 1:40 splits (i.e. aggregates from 1 well can be plated in 10 - 40 new wells). Refer to the section “Expansion and Split Ratios” below for more information. Note: Work quickly to transfer cell aggregates into new cultureware to maximize viability and attachment. Place the plate in a 37°C incubator. Move the 6-well plate in several quick, short, back-and-forth and side-to-side motions to disperse cell aggregates across the surface of the well. Note: Ensure that newly seeded cell aggregates are evenly dispersed across the entire surface. Uneven distribution may result in differentiation of human ES/iPS cells. Gentle Cell Dissociation Reagent was added to H1 cells in mTeSR™1 on Corning® Matrigel® that were ready for passaging. At time zero, the colonies are phase bright in the centers. After 6 to 8 minutes of incubation with Gentle Cell Dissociation Reagent at room temperature, the colonies appear phase bright across the whole colony when observed at lower magnification (20x, 40x). At higher magnification (100x, 400x), junctions between the cells within a colony are starting to appear, and a few, very small holes may be observed. These cells are ready to be passaged, and dissociation should be stopped by removal of the reagent. By 10 minutes, entire colonies appear very phase-bright as the cells loosen their attachments to each other and to the dish. More holes in the colonies become apparent, and become larger over time (12 - 20 minutes). These cells have been overexposed to the reagent and are not optimal for passaging. An incubation time of 6 - 8 minutes is recommended based on use with cultures maintained in mTeSR™1 or TeSR™2 medium on Corning® Matrigel®. Incubation time may vary if alternative matrices or media are used. Do not exceed the recommended incubation time as this may result in breakdown of colonies into a single-cell suspension, which will cause poor survival and reduced attachment. Significant quantities of single cells after dissociation may also put selective pressure on cell populations. Since the incubation is at room temperature, it is easy to monitor the progress of dissociation carefully under the microscope to confi rm the optimal timing when the cells begin to loosen (Figure 1). Once this occurs, work quickly to aspirate Gentle Cell Dissociation Reagent from the well and add culture medium (mTeSR™1 or TeSR™2) to inactivate the reagent. Once in suspension, gentle pipetting with a 2 mL pipette should be sufficient to break up the cell aggregates to an appropriate size. Aggregates should be as uniform as possible and approximately 100 μm in diameter. If aggregates are too large, such that they rapidly sink to the bottom of the tube, increased differentiation may be observed within the resulting colonies. Very small aggregates may show compromised attachment. In general, the cell aggregates generated during passaging with Gentle Cell Dissociation Reagent should be of the same size as those obtained during enzymatic passaging using dispase. As with enzymatic passaging methods, the cell aggregates produced are fragile and will continue to dissociate if left in suspension. Avoid any extra processing steps or delay in replating of cell aggregates, as they will have optimal viability and attachment when they are replated as quickly as possible. Centrifugation of aggregates to wash out the Gentle Cell Dissociation Reagent is not required, and is omitted to improve viability and maintain correct aggregate size. It is also advisable to pre-warm fresh medium and administer into new matrix-coated cultureware beforehand. To minimize the time to replating, passage a limited number of wells at once until familiarity with the method is achieved. Expansion of cell aggregates per passage can be very high (normally 12 to 40-fold) allowing the use of relatively large split ratios. Splits of 1:10 to 1:40 are suggested but will vary with different matrices, media, or cell lines, as well as the experience and technique of the operator. High recovery of aggregates is facilitated by avoiding washing and centrifugation of non-enzymatic reagent from the cells, and can be further facilitated by working quickly to replate the aggregates before further dissociation occurs. In general, it is best to plate enough aggregates so that the plate will be 50 - 75% confluent 5 - 7 days after passaging. Plating too many aggregates will result in overly dense cultures, which will limit the expansion of the culture and can lead to increased spontaneous differentiation. On the other hand, plating too few aggregates will result in low colony density, poor growth, and loss of cultures. The volume of cell aggregate mixture to replated can be determined either using split ratios or by counting and plating a defined number of aggregates. If split ratios are used, it is recommended to test a couple of different split ratios in the range of 1:10 to 1:40 for the first few passages to determine a range that will be successful for each unique combination of cell line, matrix, and handler/operator. Split ratios can also be adjusted at each passage based on the appearance of the culture, by increasing the amount of aggregates plated if cultures appear more sparse than usual and decreased if cultures appear more dense than usual. As a general guideline, at the time of passaging, the plate should be about 50 - 75% confluent, with many colonies just beginning to merge together. Colonies should be multilayered and appear phase-bright in the center when viewed with phase contrast. If appropriate culture density is maintained, the average expansion achieved will typically be similar to the split ratio used. For example, cultures maintained using median split ratios of 1:20, showed an average expansion per passage of 15 to 20-fold (Figure 2a). Alternatively, a separate operator successfully maintained cultures at the proper density using higher split ratios – median 1:40 – and an average expansion per passage of 30 to 40-fold was observed (Figure 2b). These examples demonstrate how more experienced users, working quickly and carefully to maintain aggregate integrity, can achieve higher expansion per passage when higher cell yields are desired. An alternative to using split ratios is to count the cell aggregate suspension concentration, and to plate a defined number of aggregates according to the size of the cultureware. For example, plating approximately 300 - 400 clumps per well of a 6-well plate should give an appropriate culture density for cells grown in mTeSR™1 or TeSR™2 on Corning® Matrigel® coated plates. This method is more precise and easier to maintain a consistent culture density; however care should be taken not to leave the aggregates in suspension for too long while performing the count, to avoid further dissociation. For detailed instructions on the “clump count” method, refer to the Technical Manual: Maintenance of hPSCs in mTeSR™1 and TeSR™2 (Document #29106). Cells passaged using Gentle Cell Dissociation Reagent have the same characteristics of pluripotent stem cells as those passaged using other methods such as dispase. Colonies have well-defined borders and exhibit a homogenous appearance of cells throughout the whole colony. When ready for passaging, colonies are multilayered in the center, giving them a phase-bright appearance. 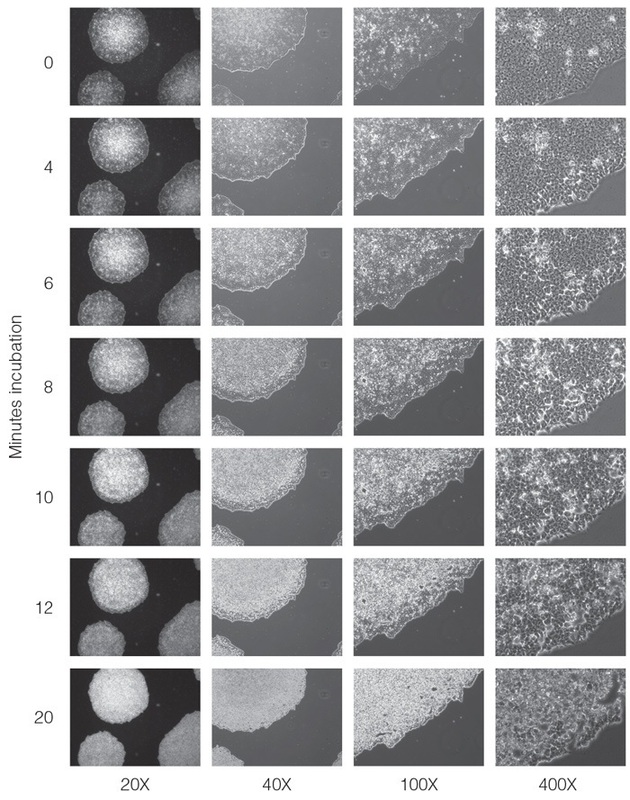 Cellular morphology within the colony is characterized by high nuclear-to-cytoplasm ratio and prominent nucleoli (Figure 3). As shown in the examples in Figure 4, the cells retain high expression of pluripotency markers including SSEA-3 and OCT4 (OCT3) after 5 - 20 serial passages using Gentle Cell Dissociation Reagent. Cells also remain karyotypically normal after long-term passaging (Figure 5), indicating that the passaging technique does not compromise genomic integrity. Human ES (H1 and H9) and iPS (A13700) cells were cultured in mTeSR™1 or TeSR™2 and serially passaged using Gentle Cell Dissociation Reagent. Expansion was measured at each passage by dividing the number of cell aggregates at harvest by the number of cell aggregates seeded (determined retrospectively from the aggregate concentration and split ratio used). Average expansion per passage ± standard error of the mean are shown, based on 1 - 3 experiments for each condition, each with 10 - 20 passages performed in duplicate. A) Cultures passaged with a median split ratio 1:20 (10th - 90th percentile 1:10 to 1:25), gave 15 to 20-fold expansion. B) Cultures passaged by a separate operator, with a median split ratio 1:40 (10th - 90th percentile 1:20 to 1:60), gave 25 to 50-fold expansion. Human ES cells (H1) and iPS cells (A13700) were grown in mTeSR™1 and TeSR™2, respectively, and serially passaged up to 20 times using Gentle Cell Dissociation Reagent. The 20x magnification shows colonies that are ready to be passaged after 7 days in culture. The 100x magnification shows the distinct edges of the colonies and the homogenous morphology of the cells throughout the colony. A) Representative flow cytometry analysis of SSEA3 and OCT4 on H1 cells grown in mTeSR™1 and A13700 cells grown in TeSR™2 on Corning® Matrigel® serially passaged 10 times using Gentle Cell Dissociation Reagent. B) Summary of flow cytometry analysis performed after 5 - 20 passages using Gentle Cell Dissociation Reagent. 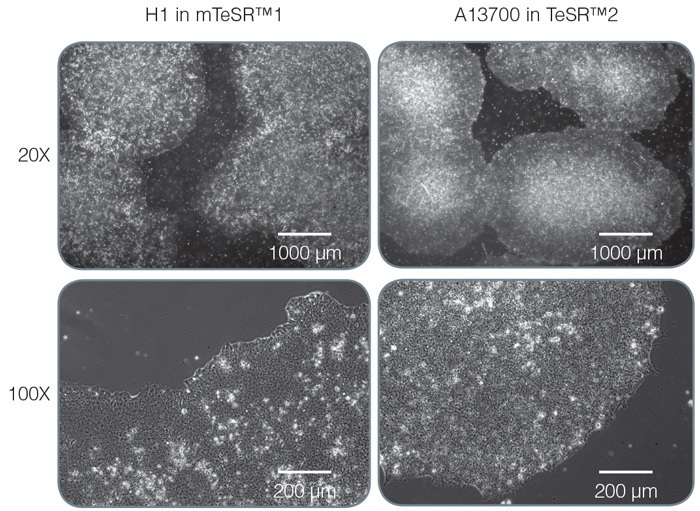 Human ES (H1, H9) or iPS (A13700) cells were grown in mTeSR™1. Number of experiments performed for each condition is indicated at bottom of bars; nd = not done. Positive gates were set based on exclusion of cells labeled with the secondary antibody only. Representative data showing a normal 46, XY karyotype of H1 (p62) cells grown in mTeSR1 after 18 passages using Gentle Cell Dissociation Reagent. Gentle Cell Dissociation Reagent can be used routinely for enzyme-free long-term passaging of human embryonic and induced pluripotent stem cells. The quick and simple protocol is performed at room temperature and does not require a centrifugation step. Cultures passaged using this protocol have undifferentiated morphology, good expansion, and high levels of pluripotent marker expression. For a complete list of related products, including specialized cell culture and storage media, matrices, antibodies, cytokines and small molecules, visit www.stemcell.com/hPSCworkflow or contact us at techsupport@stemcell.com. Recommended antibodies include Anti-Human OCT4 (OCT3) Antibody, Clone 3A2A20 (Catalog #60093) and Anti-Mouse SSEA-3 Antibody, Clone MC-631 (Catalog #60061).